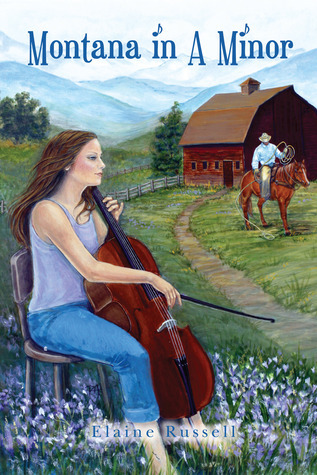 Montana in A Minor by Elaine Russell is a young adult novel about Emily Lopez, a virtuoso cellist player and nearly 17, whose confidence has been shaken by a poor showing at a Julliard audition. Emily loses herself in her music normally, but since that fateful audition, she’s having a hard time focusing, especially when her summer plans fall through with her father, who is a famous conductor on a whirlwind European tour. Rather than spend time with her father learning the Camille Saint-Saëns composed his Cello Concerto No. 1 in A minor, Op. 33, Emily is packed off to Montana with her mother, brother Adrian, and step-father, as they spend time with her step-father’s dad who is having some health issues. Out in the country her OCD symptoms do not abate, despite the calmer setting. The pressure from her father is still with her, she has to be the best to make the cut at the competition in order to gain early acceptance into Julliard. But she’s spent her spring semester in school earning credits for teaching disadvantage kids how to play music, and she’s waffling about whether Julliard and world tours are her future. While on the ranch, she loosens up little by little, playing poker with Jake, her step-father’s dad, in the evening and riding with ranch hand, Breck in the afternoons. Her time on the ranch is full of beautiful passages and frenzied moments, just like the concerto, but until she can learn to break free of her anxieties, she won’t be able to master the score and grab her own future by the reins. Montana in A Minor by Elaine Russell melds music, emotion, and psychological elements in an engaging coming of age story. Elaine Russell graduated with a BA in History at University of California, Davis, and an MA in Economics at California State University Sacramento. She worked as a Resource Economist/Environmental Consultant for 22 years before beginning to write fiction for adults and children. She became inspired and actively involved with the Hmong immigrant community after meeting Hmong children in her son’s school in Sacramento and reading Anne Fadiman’s The Spirit Catches You and You Fall Down. Since then she has been to Laos many times to research her book and as a member of the nongovernment organization Legacies of War. I like Russell’s first book, so I’d like to read this one at some point. Glad you enjoyed it. I thought this was great for a YA book. I think The Girl would like it. Screwing up at an audition is THE WORST! You re-live it over and over, so I can relate to what this novel is about. I read a book set in Montana recently, The Home Place. The story was ho hum but the setting… I’d like more of. I really enjoyed the ranch lifestyle in this one and how she didn’t want to adapt to it at first. She has some OCD issues, but they really aren’t overly prevalent. I really liked it.